Which Kimchi is Best for Sinusitis Treatment: Vegan or Seafood? Several people have recently written to me about kimchi and asked why I originally chose vegan kimchi over kimchi containing a seafood ingredient (typically fish or shrimp sauce) for sinusitis treatment. I have also been asked whether vegan kimchi has enough Lactobacillus sakei bacteria in it as compared to kimchi made with a seafood seasoning. (see Sinusitis Treatment Summary page and/or Sinusitis posts for in-depth discussions of Lactobacillus sakei in successful sinusitis treatment). Korean kimchi is a fermented food typically made with cabbage and other vegetables and seasonings, and can contain some seafood (perhaps fish or shrimp sauce) as a seasoning, or just be vegan (no seafood ingredients). It can also be made using a starter culture. These questions arose because Lactobacillus sakei (L.sakei) is commonly found on meat and fish, and plays a role in the fermentation and preservation of meat. L.sakei "outcompetes other spoilage- or disease-causing microorganisms" and so prevents them from growing. Thus it is considered beneficial and is used commercially in lactic acid starter cultures (for example, in making European salami and sausages). L. sakei was originally isolated from sake or rice wine (thus plant origin), is found in very low levels in some fermented sauerkraut, and according to the studies I looked at, is found during fermentation in most brands of Korean kimchi. Currently there are over 230 different strains of L.sakei isolated from meat, seafood, or vegetables from all over the world (from S. Chaillou et al 2013 study looking at population genetics of L.sakei). So this bacteria, which is found by using state of the art genetic analysis, turns out to be quite common. So why did I only use vegan kimchi and only mention vegan kimchi in our Sinusitis Treatment method? It's because when I first started dabbing kimchi juice in my nose about 1 1/2 years ago, I was in uncharted territory. I was desperate for something with L.sakei in it, and from my reading I found kimchi. However, putting (by dabbing or smearing) a live fermented product in my nostrils was a big unknown. When I first opened some jars, the kimchi juice would bubble and sometimes overflow and run down the sides of the jar. Would the microbes in kimchi harm or benefit me? Obviously I was conducting an experiment with unknown results. I settled on vegan (no seafood) kimchi because a totally plant-based product sounded safer to me. I wondered what other microbes are in the kimchi with seafood. Could any of them be harmful? 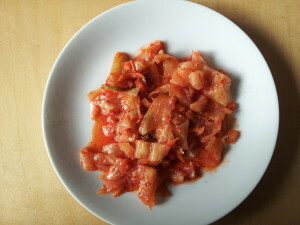 And my choice of vegan kimchi turned out great. Our experiences with kimchi are that it works amazingly well in treating sinusitis and causes no harm (as far as we can tell). This is the best I've felt in many, many years - back to normal! But I don't know if other brands of vegan kimchi, with different recipes and ingredients and thus different microbial communities, would have worked out so well. The levels of L.sakei and other beneficial microbes in the many kimchi brands are unknown. So now I wonder- if L. sakei is so pervasive on meat and seafood, perhaps kimchi with a seafood ingredient in it would be even better, with consistently higher amounts of L. sakei. Or maybe there is no difference between the two kinds of kimchi. Only the very expensive state-of-art genetic testing would give me the answer to that question.